A makeshift refugee shelter beside the highway east of Diffa, Niger. “Our team in Niger describes the situation as very serious with acute shortages of shelter and non-food items for the displaced,” Adrian Edwards, spokesperson for the Office of the UN High Commissioner for Refugees (UNHCR), told journalists in Geneva today. These newly displaced include local villagers, internally displaced people (IDPs), people who have been displaced several times, and Nigerian refugees, according to a recent UNHCR team visit. “UNHCR is redirecting available resources to meet the urgent shelter and other assistance,” Mr. Edwards said, calling on donors for extra support to help this vulnerable population. The agency’s current Niger operation is about half funded with $24.9 million received against overall requirements of $51 million. While struggling to cope with the humanitarian needs, UNHCR and partners have conducted a more comprehensive registration to simplify needs identification, delivered food in south-east Niger’s Diffa region, and offered health care and sanitation. 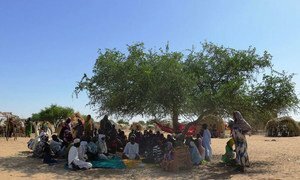 However, many newly displaced, who have sought shelter alongside Niger’s National Route No. 1, are without protection by the Niger army. Moreover, they do not have adequate access to water sanitation, shelter and school. “Providing assistance and shelter is all the more difficult because people are living in spontaneous sites rather than in a camp environment,” warned Mr. Edwards. The conflict in north-east Nigeria has forced more than 220,300 people to find refuge in neighbouring countries such as Niger, Cameroon, and Chad since 2013. In Niger, insurgent incursions had displaced an estimated 50,000 people within the country, according to UNHCR.